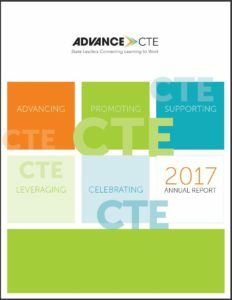 2017 was an incredible year for Advance CTE! We engaged more members than ever before, launched multiple initiatives and released over resources covering many of the most critical challenges the field is facing. This year’s annual report is organized around our five strategic priorities: advancing federal and state policy, promoting high-quality CTE, providing professional learning opportunities, leveraging partners and developing healthy organizational processes. We hope you enjoy reading about our accomplishments, which could not have been possible without all of you and your support! This entry was posted on Tuesday, January 30th, 2018 at 10:02 am	and is filed under Advance CTE Announcements, Advance CTE Resources, News. You can follow any responses to this entry through the RSS 2.0 feed. Both comments and pings are currently closed.